I can’t believe that it’s already time to start thinking about Christmas decorations! The holidays sneak up on me every single year, so why not get started a little early this time around? If you’ve ever attempted to make Salt Dough Christmas ornaments, you will know how easy and fun they are. 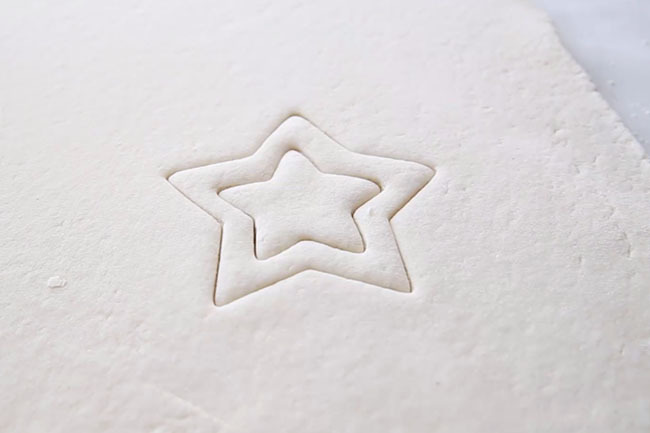 If you haven’t tried it yet, now is the time to make these Star Salt Dough Decorations! 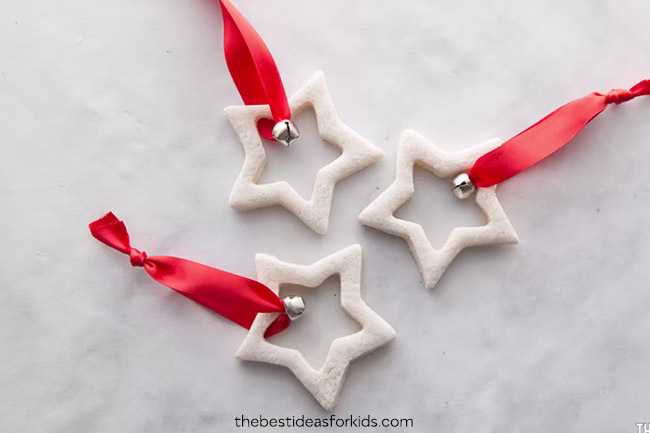 These salt dough ornaments are so easy to create and would make the perfect Christmas gift to give out to teachers and co-workers. 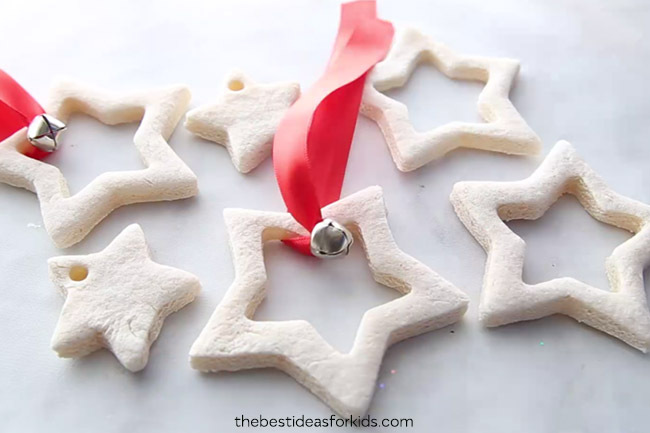 Kids can make these Salt Dough Decorations themselves and they will turn out beautifully every time. Switch it up to personalize it or make it just like the tutorial! 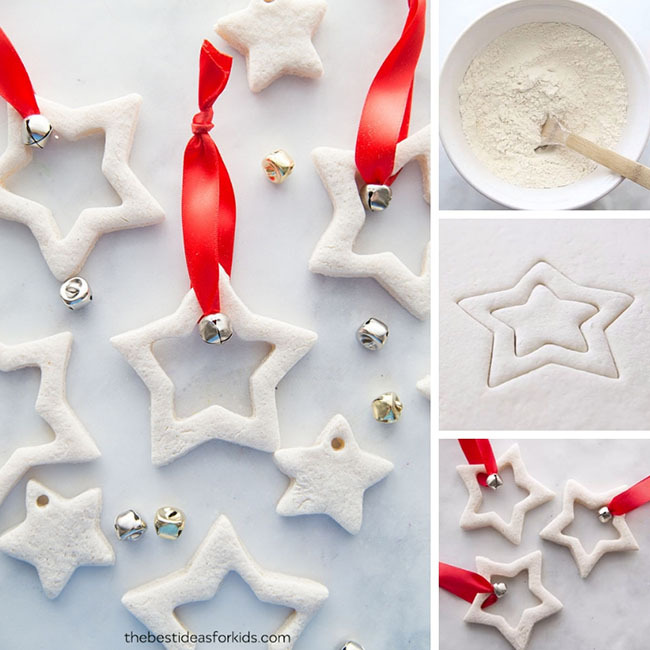 We just love how simple these salt dough ornaments are to make! You don’t even need to paint them but if you want to make them different colors, simply just paint them after they are done baking. These would make perfect handmade Christmas gifts for grandparents, teachers or parents! 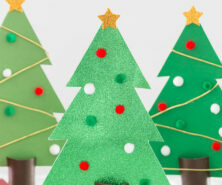 Even preschoolers and toddlers can help make them and parents can bake them and package as gifts. Just a friendly reminder to keep these out of reach of pets (they can be toxic to dogs especially) and small children that would want to put them in their mouths. 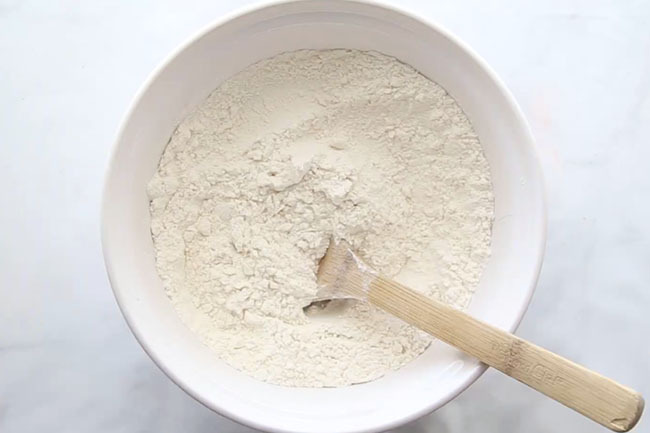 Begin by mixing the flour and salt together. 2. Add the water until it starts to form a dough. 5. 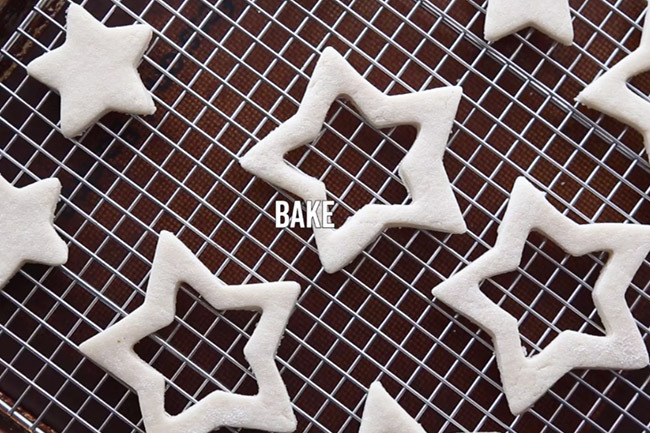 Cut out star shapes using a small and large star cookie cutter. 6. 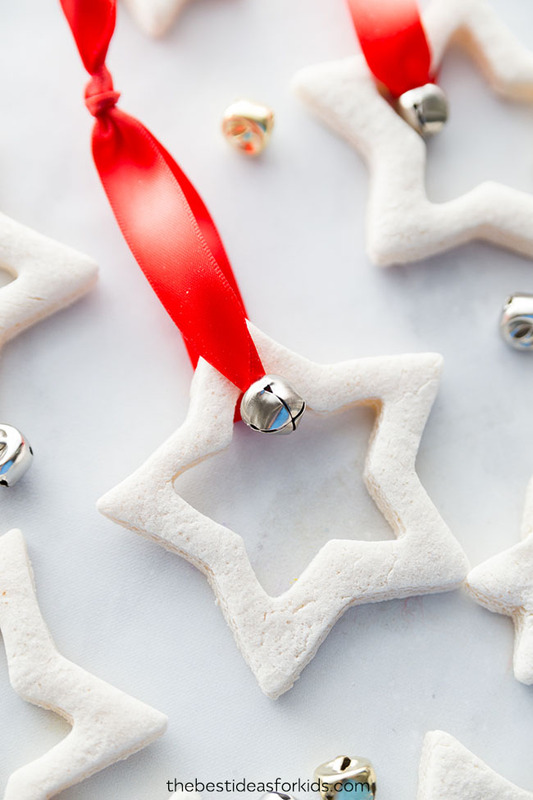 Place the salt dough shapes on a parchment paper lined cookie sheet or non-stick baking pan and bake at 250 degrees F for about 2-2.5 hours (Adults only). If the dough is not completely dried out, you can let it bake longer or turn the temperature of the oven slightly up. If you do decide to turn the temperature up, keep an eye on the ornaments to make sure they do not puff up. If this happens, turn the temperature back down. If you find the ornaments are still not dry, let them sit out on a cookie drying rack to air dry overnight. 7. Once they are full dry, seal with either mod podge or a clear glaze spray. We like this spray for a durable finish. Adults should do the spraying and always follow directions of the product chosen. Sealing the final ornaments will help stop them from cracking in a few years. 8. Next, thread some narrow ribbon through some bells. 8. Then tie the ribbon around the salt dough ornaments so that the bell is in the center. 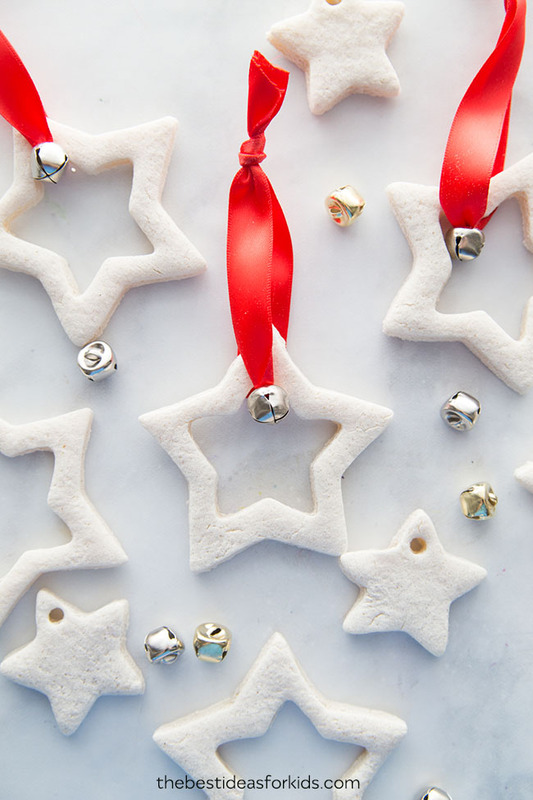 And now you have your finished salt dough star ornaments! Hang some from the tree or attach them to gifts. You can even put names and dates on the back before you bake them. 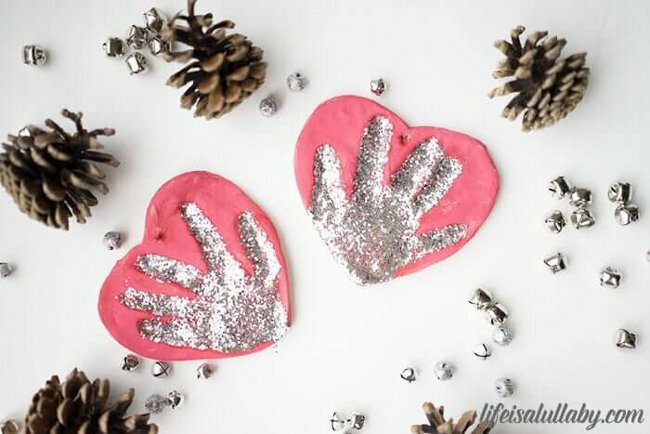 And if you love these handmade Salt Dough Ornaments be sure to also see these Handprint Salt Dough Ornaments. 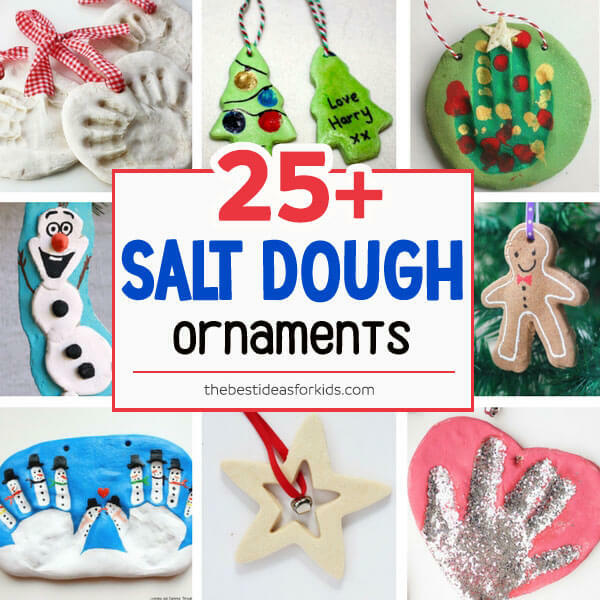 See over 25+ of the best Salt Dough Ornaments here for more great ideas! 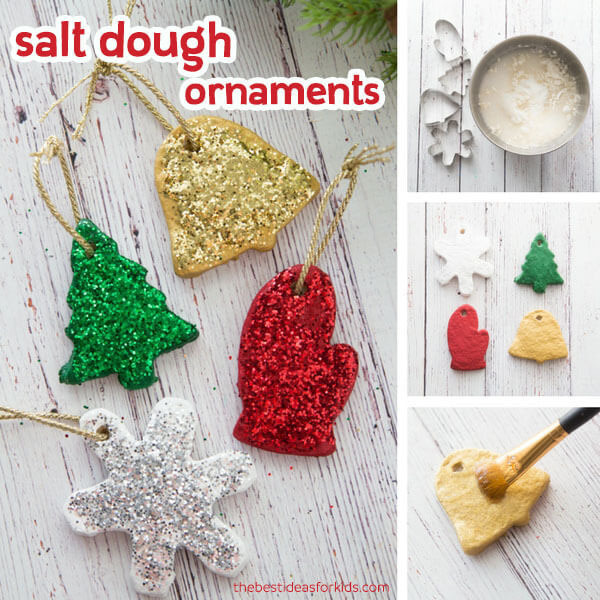 These salt dough glitter ornaments are so fun to make and look great on the Christmas tree! Do I make thw holes for the ribbon before or after baking them ? You have to make them before baking. Can hardly wait to try these with my Sunday school class tomorrow! I can’t move them without them loosing their shape. Any tips? 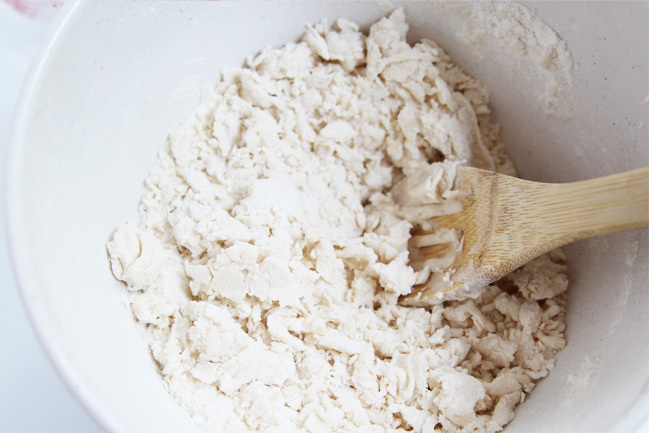 When placing down make sure you have a lot of flour under them so they don’t stick to their surface. Then gently use a flipper to lift them up. What is the best way to use glitter? 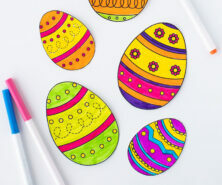 We recommend sealing first and then adding glitter on top with some glue. Can these ornaments air dry? You can let them air dry however we do recommend still baking a little bit to ensure all of the moisture is removed and to prevent molding. Can the ornaments be painted? If so what kind of paint? 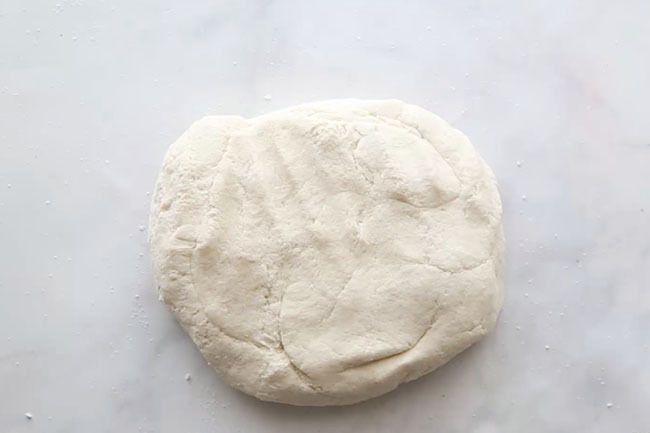 Can you make the dough and then put in fridge to use later? Putting it in the fridge for less than a day should be fine but it will make the dough hard so you’ll need to let it sit out for awhile to get back to room temperature before trying to work with it. Can this dough be layered, then baked? I want to put students initials on top. I don’t see why not but you may want to just make sure you can bake it fully through since that would make it thicker. About how many ornaments does one batch make? I have 19 students and would like to make this with them. It depends on the size of your cookie cutters but you’d probably need 3 batches just to be on the safe side. 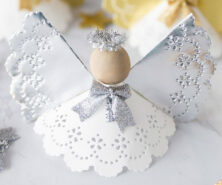 These homemade ornaments are adorable and I can’t wait to try them with my grandsons! We hope you have fun Paula!